Candy is a lovely heritage-type bay Morgan mare of 13 years. Candy was raised and trained by her owner, Lisa M. of Virginia. I should point out that Lisa is not just another yahoo who got in too deep with her first training project. There are plenty of people who can help those people through Horsemanship 101. Actually, Lisa’s one of the people who helps those people! 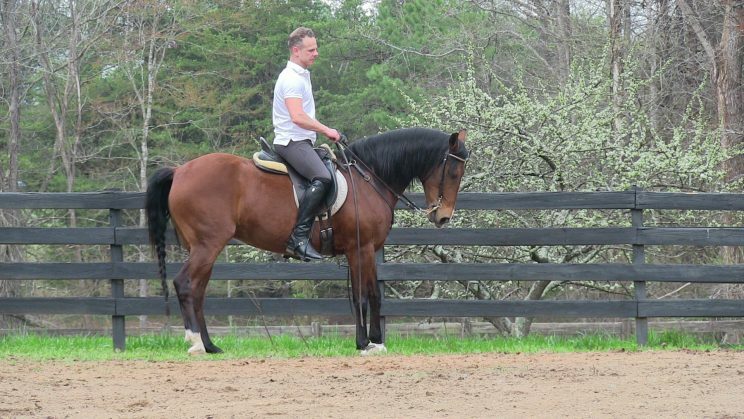 As an experienced rider, natural horsemanship coach, and a certified Parelli Instructor, Lisa understood well enough the concept of basic obedience training … but she’d seen a whole new world after riding a fully dressed school horse (a Morgan, in her case), she wanted something that would handle similarly. Candy’s February 2016 “Ride 001” video may not do a great job of exposing it, but Candy is a very experienced trail horse, and has been in exhibitions, parades, and won her share of local open shows. So she must be “trained”, right? Yes and no. Like the majority saddle horses, Candy was trained – to a point. With her cool personality, she was happy to carry a rider without much fuss about it at the walk or trot. 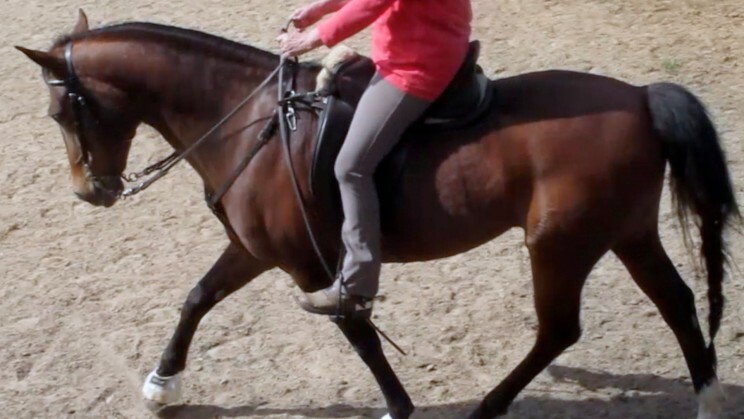 She would canter for a few crooked strides – until it became work, then resist. She would back – but only if you really insisted, and only in a reluctant, choppy spiral to the right. She was a very poor “conversationalist”. This is to say: she was happy to walk once you asked her to walk, but after that: please leave her the H-E-double hockey sticks alone, and don’t get picky about the kind of walk – or anything else much. Like most unfinished horses (which is most horses – yep, even your “dressage horse” – in most cases; in fact: especially), she was highly agitated by the notion of actual contact. I don’t mean heavy traction – which is a physical support pretending to be ‘contact’. I mean just and only a ‘live’ rein, versus either an abandoned or restraining rein – a rein which is open for communication on the one hand, but insists upon self carriage on the other. I mean listening with concern … the way your husband listens when he wants something, versus the kind of listening he does while staring at a screen of some sort, and saying “uh-huh” every 100 words. I mean listening. 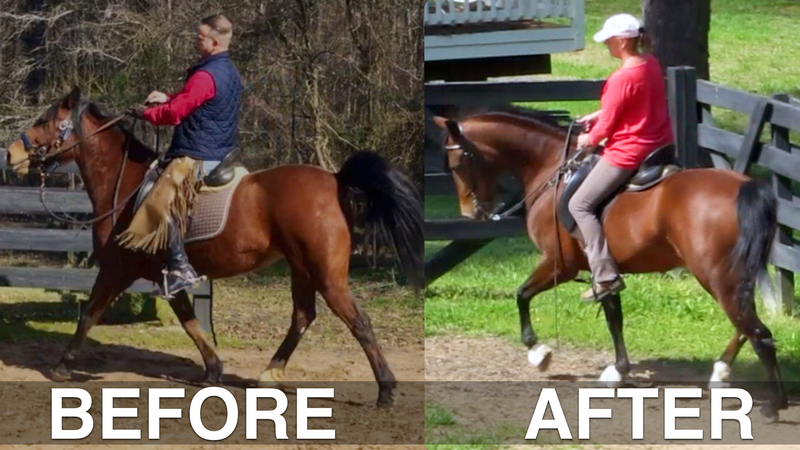 Stay tuned for the follow up clip showing the basic progression of a mare who well represents the “trained” horsey population, and be amazed at what a little Baucherist magic can do for her mind and body. Transformed in a matter of weeks, Candy is reintroduced to her owner who finds her a very different ride than the one she’d known for over ten years.